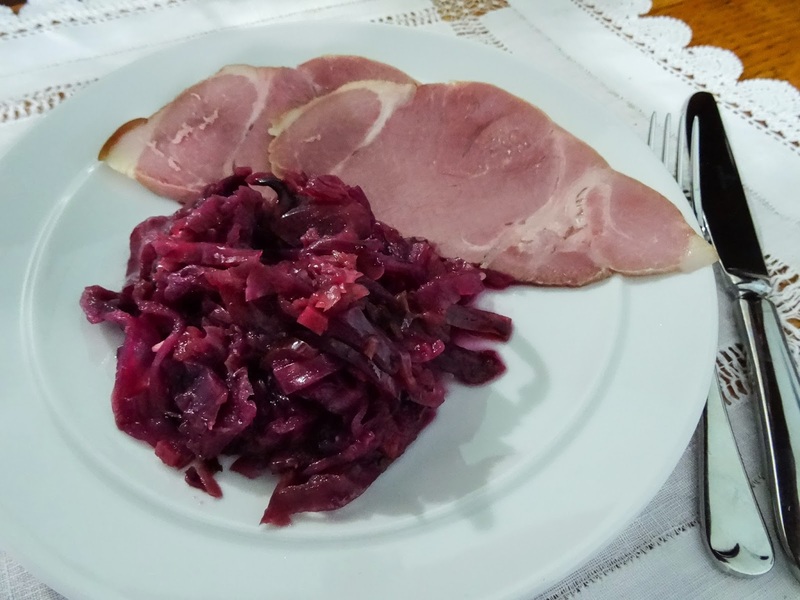 I love baked red cabbage in the winter months, it's easy to make, will keep well in fridge for 2-3 days and can be reheated just before a meal, it would be perfect with Christmas lunch or served with left over ham or turkey after the big day. The Mackays Spiced Ginger Preserve adds a nice kick to this dish making it even more warming than usual. 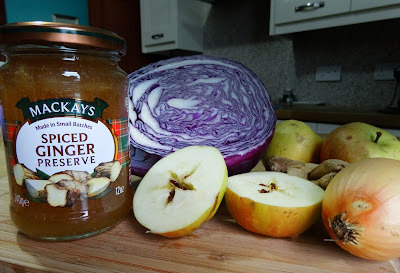 I'm delighted to say that this post is part of #ChristmaswithMackays a 12 days of Christmas feature being run by Mackays, a family run Scottish company who make their preserves in small batches in the traditional way. 1. Pre-heat the oven to 325F/160C. 2. Slice the cabbage, peel and slice the onions. Peel, core and slice the apples. 3. 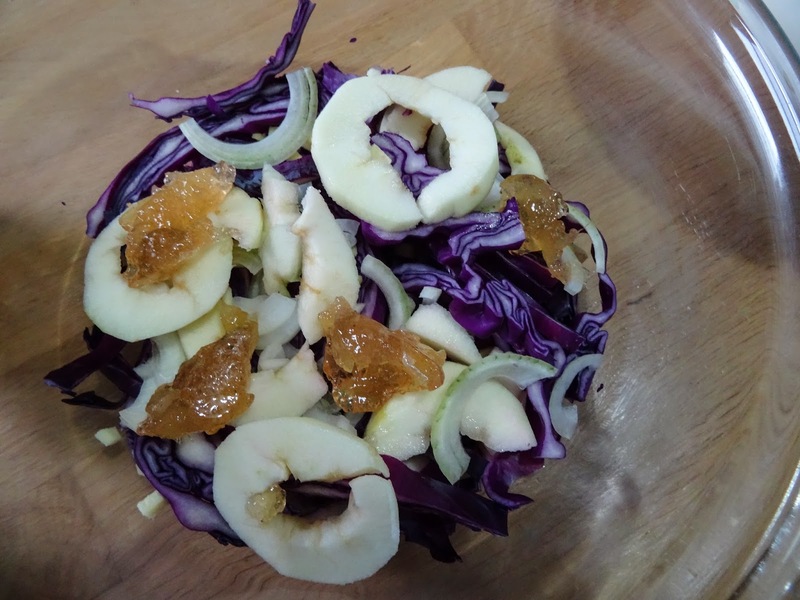 In a deep ovenproof casserole dish, build up layers of cabbage, onion and apple and finely chopped fresh ginger, add a tbsp of Mackays Spiced Ginger Preserve and start the layers with the cabbage again. There should be around 3 layers. Finish with a layer of cabbage. 4. Sprinkle over the salt and the soft brown sugar. 5. Add the wine vinegar. 6 Put a lid on the casserole or use a piece of foil. 7. Bake in the pre-heated oven for 1 1/2 - 2 hours. When the cabbage is soft, it is ready. You can make this even more festive by adding fresh cranberries and an additional tbsp of soft brown sugar to counteract the acidity of the berries. Many thanks to Claire at Mackays for the samples of Mackays preserves, I was not paid for this post and all opinions are my own. Love red cabbage ad as you say it keeps well too...hubby is not a fan but this ginger twist would tempt him...great idea! Nice touch adding ginger to red cabbage. Off to the shops to get that spiced ginger preserve. Do you think it would be possible to make this in a slow cooker? I haven't tried it in a slow cooker, but I think it should work ok.